With the British team advancing in the Euro 2012 football cup, London pubs are filled to the brim every game night. When the sport-drinking fun is over, “booze buses” are there to collect enthusiastic supporters from the streets. It is a part of English football culture to have a pint or two of beer while watching a match at a pub. Although many of the fans prove to be responsible drinkers, every football night is a busy time for The London Ambulance Service. To solve the problem of drink-induced incidents, the service dispatches “booze buses” – an alternative to ambulances – which whisk away drunks to alcohol recovery facilities. The buses begin operating around 7 pm and run all night, with a peak demand at 9.30 pm. Each bus can simultaneously take up to five people to a detox center, freeing up the ambulance service to deal with other potentially more life-threatening calls. “This year for the euros we’re running every time that England plays,” Brian Hayes, the paramedic who came up with the idea of “booze bus” services, told RT. “The one thing we have an excess of that you wouldn’t get on a normal ambulance is the world’s equivalent of vomit bowls,” he explained. He also outlined the need for eco pads “on every chair” as many of the drunk revelers tended to urinate themselves and worse. Siobhan McCann from Drinkaware says the teams fortunes are inconsequential, as victory and defeat are both excuses to drink for those watching the game. “Our advice is keep an eye on how much you’re drinking during the tournament, not just per game. But you must remember that the tournament lasts for 3 weeks, so drinking a lot each game over that 3 week period, your liver might have taken a bit of a battering,” she said. 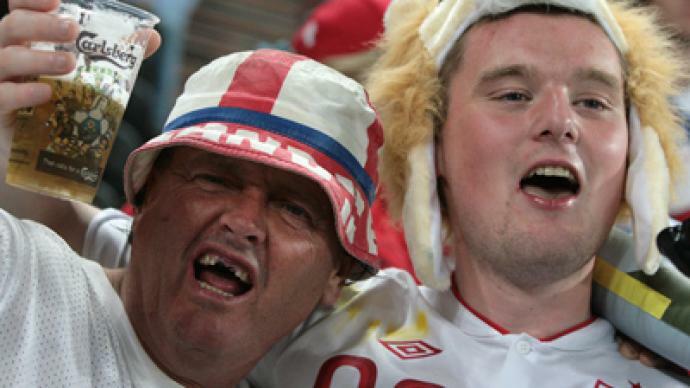 With boozy fans being such a burden to the health service and thus taxpayers’ pockets, many feel it is high time for English football supporters to sober up.